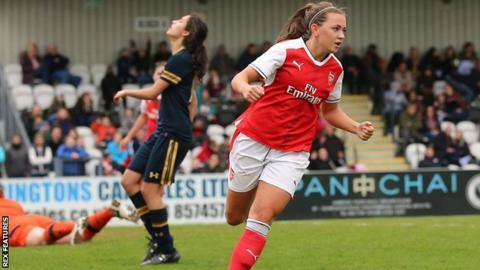 Republic of Ireland international Katie McCabe has signed a "long-term contract extension" with Arsenal Women. McCabe has scored eight goals this season for the Women's Super League leaders, who have not revealed the length of her new deal. Coach Joe Montemurro said: "Katie is a very versatile player, strong and creative and her development throughout my time here has been very positive. "I am looking forward to seeing her continue to grow and achieve with us." McCabe joined Arsenal in December 2015 from Irish side Shelbourne Ladies and has since made 58 appearances.